A team of scientists has been demonstrated a new battery technology. This demonstration held at Shenzhen Institutes of Advanced Technology (SIAT) of the Chinese Academy of Science. This is fully novel, eco-friendly, non-expensive battery. It is named as Aluminium Graphite dual ion battery. AGDIB came as a solution over the Lithium-ion battery (LIB) problems. As compared to LIB, AGDIB offers light weight, larger volume, and higher energy mass. Its electrode is composed of aluminum and graphite materials which are fully eco-friendly. Normal Lithium salt and Carbone salt is used in its electrolyte. After 200 charge and discharge cycles, the battery shows the reversible capacity of similar to 100mAh-1 and retention capacity of 88%. It supplies energy density similar to 150 Whkg-1 at a power density of similar to 1200W kg-1, which is 50% higher than profitable lithium-ion batteries. Generally, lithium-ion batteries are used in tablets, smartphones, electric vehicles and renewable energy system. Most of the batteries contain harmful metals in their electrodes, thus, it is responsible for major environmental damage and problems. During charging, Anions in the electrolyte inject into graphite cathode. On the other hand, Li+ ions in the electrolyte saved into the aluminum counter electrode to form an Aluminium-lithium alloy. The discharge process is exactly opposite of charging process. All Anions and Li+ ions diffuse back into the electrolyte. The AI counter electrode in AGDIB acts as an anode. At the same time, the current collector, the dead load, and the dead volume are quite decreased to make a battery with high energy density and high volume energy density. Similar to 222Wh Kg-1 at a power density if 132 WKg-1, and similar to 150 Wh Kg-1 at 1200 W Kg-1. The volume energy density is similar to 560 Wh/L, which is higher than usual batteries. This new battery technology (AGDIB) has a great potential to be used in various large-scale applications like electronic devices and electric vehicles. 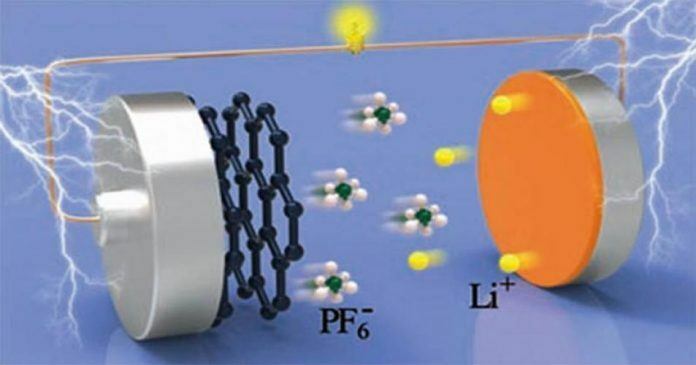 The favorable degradation of this novel battery technology has a great potential to slightly increase the achievement of portable electronic devices, vehicles, and renewable energy systems.